I’ve been spending the morning preparing for tomorrow’s Emporia Farmers Market. This is my first time as a vendor, and I’m trying to make sure I have everything. This first thing was to decide on the books to take and how to display them, so I tried out an arrangement at home. One possibility is pictured above. 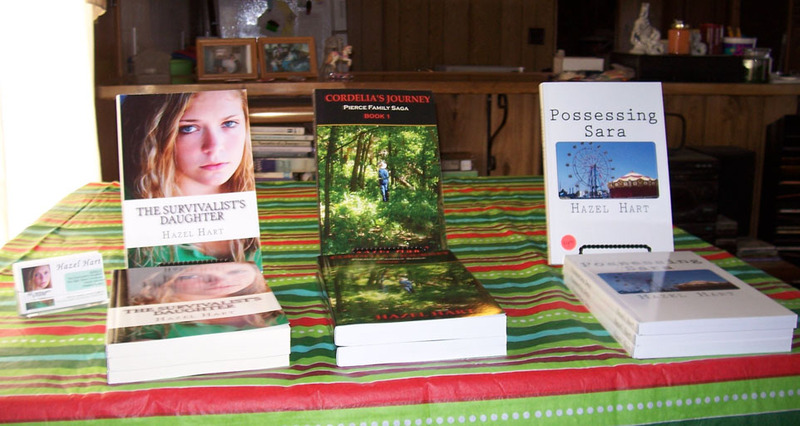 Cordelia’s Journey is in the middle. I like the order the books are in on the table, but I think I’ll move them back a few inches and put a little more space between books to make room for the business cards in one space and maybe a dish of peppermints in the second space. In addition to choosing the books, I’ve priced them and packed them in the car. I also updated my business cards. When the cards were printed, I didn’t have this blog, so I used address labels to put new blog and contact information on the back. I got change from the bank yesterday. All that’s left is working on my autograph. Any book signing suggestions? I almost forgot to tell you: The Emporia Farmers Market is Saturday, December 5 from 10 a.m. to noon at 727 Commercial in Emporia, Kansas. There are two additional market dates this month: December 10 from 8 p.m. to midnight and December 19 from 8 a.m. to noon. As you can see on the webpage, several authors are participating. Can you think of anything I’ve forgotten? Leave a comment and let me know. I like the book arangement, and your suggestion to move the books further apart to make room for the cards and favors would give the table a finishing touch. Good luck with your markets. The books are all great books and well worth the prize.